A year after the fifth book, the finale of Teralin Sword series comes. Five years passed since the end of the fifth book (my review). Endric had returned home but did not stay much, leading soldiers on patrols for all those five years. While it was a way to bond with the people he might be let to lead one day, it also had another motive – to be more active with the world than a leader staying in the base. After the events of the fifth book, Endric learned much about the Conclave and his intrigue about them has not abated. Knowing what he learned over the course of the series, merely leading the Denraen does not feel as fulfilling as serving the Conclave might – and thus Endric is torn between doing what might be expected of him and being closer to the mysteries of the world. The book has a bit slower start, partially due to the five-year long break and the necessary bridge. There are other problems – the succession of Denraen puts some tension between Endric and his father. Pendin also has some issues with his mother, a problem ties to Endric’s as Pendin would like to follow his friend – something that might not be possible should Endric decide to fully devote to the Conclave and thus his future is affected by Endric’s lack of decision. In those times, unsettling news come: the historian guild is silent and even Novan, who was always more active among them, knows not about why. Urged by Elizabeth, Pendin’s mother, Endric and his friends set out to find the historians and explain the silence on a journey where Elizabeth might have more in mind than just curiosity about the historians or concern for their silence. When they find Novan (in fact, Novan finds them), it’s shown things are even more complicated. As they set out to find the historians, Endric ends up separated from them (again) and reaches the city before them only to get involved in the trouble before the rest can reach the city. That leads to an action-packed finale with some revelation not only about the historians (and the problem they were coming to solve) but also some other factions of the story. I’ve been looking forward to this book and the conclusion of the series. Throughout the first five books, I’ve come to really like Endric – something made him really relatable for me. 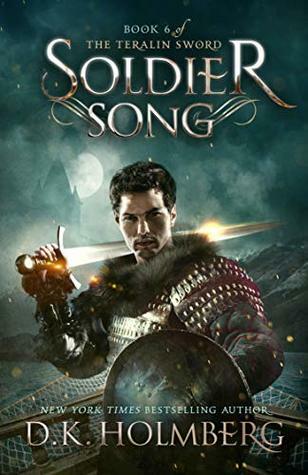 This book was also the reason the author’s other book, the Threat of Madness, is on my Goodreads TBR for more than a year: the Teralin Sword series acts as prequel series and I wanted to finish this one first. This entry was posted in Books, Fantasy and tagged book review, Fantasy, reading. Bookmark the permalink.